I have learned to not trust my memory when it comes to needlepoint. 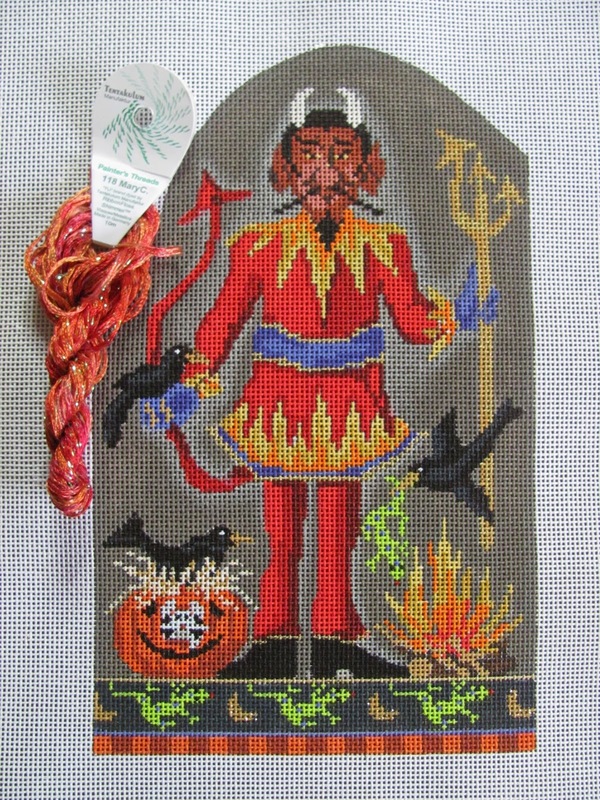 Currently I am stitching the models for the upcoming NeedleDeeva Halloween Club which will be released in June 2011. There will be 8 canvases in the monthly club, and I am writing the Stitch Guides for the group. How exciting is that! 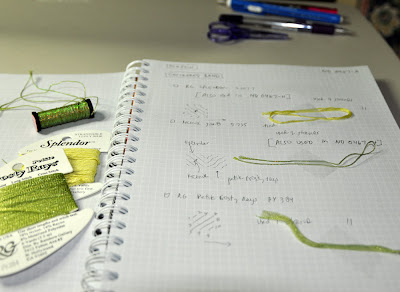 There are many things to remember and notate when writing a Stitch Guide: the name of the stitch, the threads used for the stitch (name, manufacturer, number, size), the number of strands used, the stitching order and any other helpful hints. Others might have a different routine; this is what works best for me. So once I stitch an area, I write down all of the information in a notebook. With tape, scissors, pencil and eraser near by, I write down the info and snip/tape a sample of the thread into the notebook. Kind of like a quick scrapbook. For this Halloween Club, I am keeping all of the Stitch Guides notes in my WHITELINES SQUARED notebook. Remember me telling you about the Whitelines notebook? Here's that previous link. I love the Whitelines printed on the Light Gray paper. It's really Cool. I now have 2 of the Club pieces finished: Scaredy Cat and Spidey (ND 0467-H) and Pumpkin (ND 0467-A). I just put Devil (ND 0467-B) and Frankenstein (ND 0467-C) on their respective stretcher bars. After that will be Spider (ND 0467-D), Witch (ND 0467-E), Ghost (ND 0467-F), and Dracula (ND 0467-G) All pieces are a Triangular shape... just perfect Halloween ornament size. I will be carrying threads within the series as a consideration to my fellow stitchers. Sorry to be so quiet; kind of overwhelmed with all things going on at the moment. How are you doing? 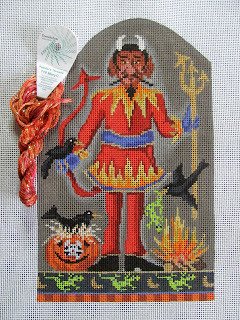 I did wanted to give you the heads up of a new blog to mark and begin following from Vicky De Angelis called Mostly Needlepoint. Here's the link. Vicky is a talented stitcher, multiple ANG winner, and stitch guide writer, too. It will be fun to see these Rainbow Birds comes to life. OK... that's all for now. Back to assembling Amy's March 2011 e-newsletter, stitching the NeedleDeeva Halloween Club for a June 2011 reveal, writing customer's stitch guides, and hugging a cat every now and then. Yes, I have been working on the Halloween Candied Apple instead of Dev L. Mann. You will see more on this canvas in a couple of weeks. So now I will be returning to the Dev L. Mann. I want to share a tip with you. I have, for some years now, been using hair tape to temporarily control threads on my canvas. I have just started using this Scotch Matte Finish Removable Tape for that. It doesn't get gummy like the hair tape does. Also, while stitching all of the beads on Sarcoph A. Gus, I started using this Thimble pad to push the needle up to the top of the canvas. I had some that I had purchased years ago when I was doing some quilting. I was thrilled to see that we stock them at Amy's Golden Strand. So these are a couple of tools that enhance my stitching experience. Never mind that I just love stitching toys! I'm going to be working on a computer project for my husband this week. So I may not get back to the Dev L. Mann till next week. See you then. I can't believe I came home with another canvas. Yesterday was a normal very busy day at Amy's Golden Strand. Toward the end of the day we received a shipment of canvases from Kelly Clark. I knew it would include a few Halloweenies and some stitch guides for the new Tassels that Kelly introduced at the January Market. Jill took them next door to sort them out. She came back in with two of Kelly's Halloween Apples. "Look, aren't these great! ", she said to Amy and me. I had not seen them yet and of course feel in love with them. Someone said we should make shop models, (our ploy for getting to stitch them). Amy said, " Maybe we can do some guides for them since we have so many customers who love Halloween canvases." Jill and I squealed like a couple of ten year olds. We actually played "enny meeny miny moe" to decide which one we would stitch. At 4:30, Amy sat down and picked stitches and threads for BOTH canvases. By six o'clock I was home with the canvas on bars. I was disciplined enough to stitch some on Dev L. Mann last night. But this afternoon, he is going to give up his dominate place in my que for a little while. I can't believe I came home with another canvas! Stitch the birds before you stitch the background. Amy has made the bird tails a little different than the painted canvas. I had to take out a little of the background to accommodate the changes in the bird in flight. However, I can't make a change to the crow on the pumpkin as his tail is already two threads from the edge of the design. This may be another case of our canvases being painted differently than Amy's. So have a good look at the crows and decide what you would like to do with their tails. I have realized that it would be best to bead stitch the gecko before the background around him as well. Also, when working the bird on the pumpkin, fill in more of a bottom on him to meet up with the pumpkin. We will put the straw on top of bird, pumpkin and background. Above is the way it is painted. Below shows that I drew a small line the extend his body. Background and the Super Bowl. As you work this background on Dev L. Mann, there are lots of little places to compensate. 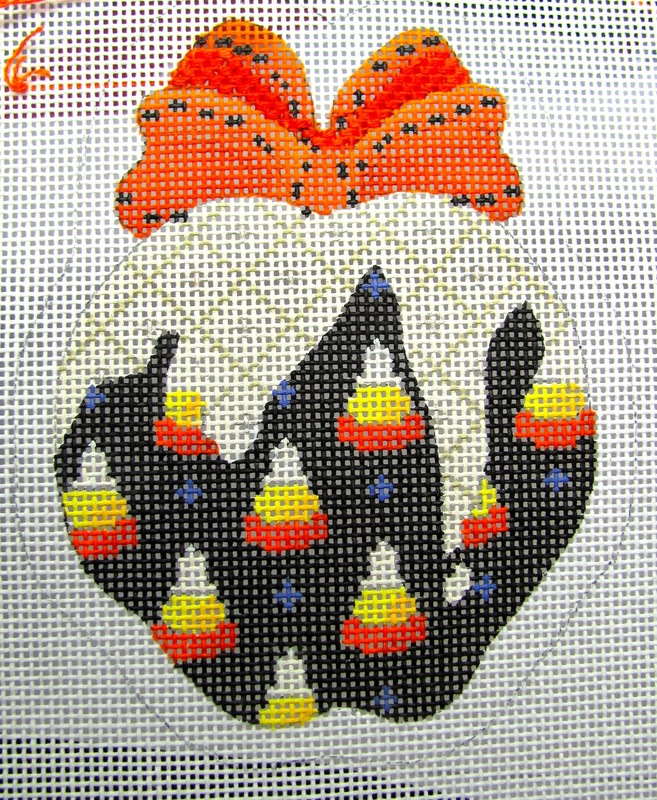 If you can't decide where to place the background stitch, leave it open until you stitch the other element. You can go back and fill in the background later. Why not do the other areas before stitching the background you ask? Well it gives me a good sense of completion to get the background done. But it is really your choice. You can be helped in this area by consulting the picture too. 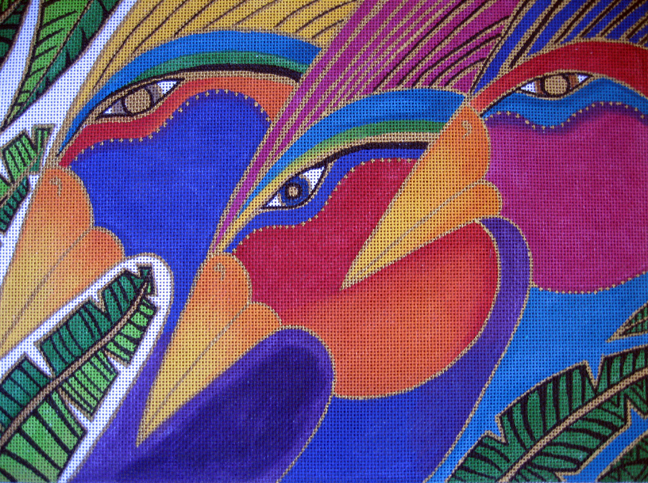 As I work on the background, I am looking forward to watching the Super Bowl. I know there are shops that are hosting Superbowl Parties. I wish I could join you, but will stitch here in my room with the TV on. My career was in television, so I love to check out the commercials that debut within the game. But I have another reason to be excited about the game. One of my nieces is married to a Steeler. He is a member of the practice squad, but has played in a few games. My brother, his father-in-law, tells me he will probably not "suit up", but will be there ready to go if called upon. It is the ultimate, "put me in coach". Yeah, put me in for a play in the Super Bowl! So enjoy stitching today and, Go Steelers! Dev L. Mann has arrived. Here he is. He apologized for being late. He promises to be fun. Isn't he cute? Here is a thread that is new to this series and new to me. It is made by the YLI folks and they call it Painters Thread. This color is prefect for the Dev L. Mann. The background is the same as the Mummy. I think I will start with that. Though I am tempted to use the Painters Tread first. It's not often when the present meets the past. Perhaps, Needlepointers in the future will honor her, as well. I will show you the last few thing I did to finish Sarcoph A, Gus. I twisted the overdyed thread and attached it to the gold toothpick. Read the directions for making the tassel several times. Then, do it the way she explains it. It makes a neat, tidy little tassel. Snip the ends and you have your tassel. I positioned the stick and secured it in place. Now the beaded Crook. Again, the directions are great. I am saving all of the bullion knots for last. It will be quite a party. I've finished the beading. It was really fun. The last area, at the top, was supposed to be string beaded...like the bottom of the sarcophagus. I was on such a roll with the stitch beading, I just stitch beaded that area too. Be sure to surround the area with black beads. It is not painted that way. If you look at it funny, you can see that it is a cuff of the hand that will hold the gold stick with the green tassel. And that is all I left to do on this guy. Well, except for the bullion knots on the geckos and the rat over his shoulder. Wow. This was a good one. We will be getting Dev L. Man soon. There will be a new thread in this kit that I think you are going to like. So keep checking your mailboxes.